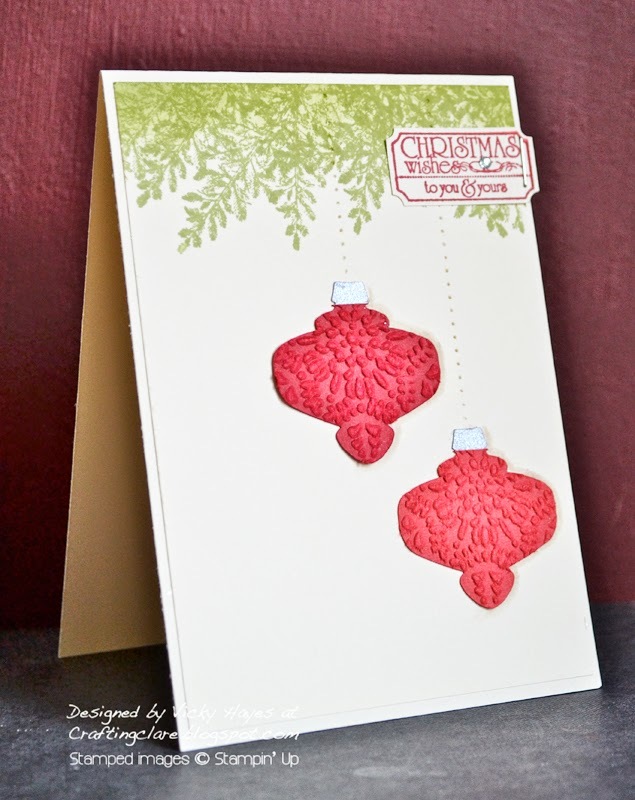 Those branches at the top of the card are stamped with the fir tree from Stampin' Up's Lovely as a Tree - that set is such a favourite of mine! I added the Christmas sentiment from That's the Ticket which punches out neatly with the coordinating punch. I love stapling these tickets onto projects or attaching them with safety pins. The baubles were given a bit of texture with the Northern Flurry embossing folder before punching out with the Christmas Ornament punch and I snipped the top off each and replaced it with a silver version. They appear to be suspended from the branches with a line of piercing - made easy with one of the Essential piercing templates. The Rudolph Day challenge requires two cards, so this photo is to show that I'm not cheating! Never mind April baubles, it's April showers we'll be looking out for this weekend, so have your rainbrellas at the ready ladies! Have a lovely weekend and I'll see you on Monday. Oh YES! These are GREAT festive cards Vicky. What a fab idea to use the fir tree as foliage (must remember THAT idea!). Great bauble punch and nicely embossed too. Great idea using Norther Flurry to give your baubles more dimension. What a pair of wonderful cards. Love that ticket sentiment.